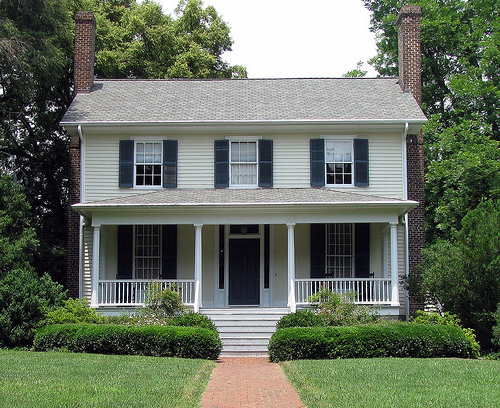 The Nash-Hooper House, located on West Tryon Street in Hillsborough, was constructed in 1772 by Francis Nash on land purchased from Isaac Edwards, secretary to Governor William Tryon. Nash, a prominent political and revolutionary military leader, was killed at the Battle of Germantown in Pennsylvania. The house was purchased in 1782 by William Hooper (1742-90), a Patriot leader and a signer of the Declaration of Independence. He died in the house and was buried on the property. Ownership was retained by the Hooper heirs until 1853, and significant additions were made to the structure during that time. William A. Graham (1804-75), governor, U.S. secretary of the navy, and Confederate senator, acquired the house around 1870. Graham also was buried in the adjacent cemetery. The Graham family kept the property until 1906. Alfred G. and Mary Claire Randolph Engstrom purchased the estate in 1959. In 1971 the Engstroms sold the house to Cecil Leroy Sanford, a retired career diplomat. Listed in the National Register of Historic Places and designated a National Historic Landmark, the Nash-Hooper House is privately owned and not open to the public. Mary Claire Engstrom, "Nash-Hooper House," Research Branch, North Carolina Division of Archives and History (1975). Nash-Hooper House. Image courtesy of Visit Hillsborough. Available from http://www.flickr.com/photos/hillsborough/3486102055/ (accessed June 13, 2012). 1 January 2006 | Cashion, Jerry C.